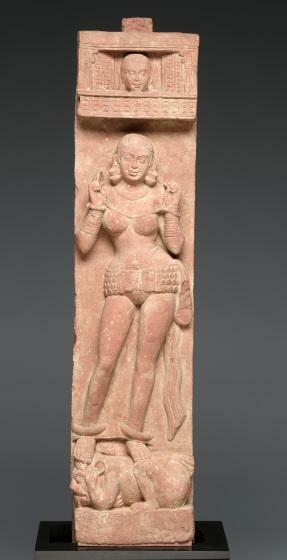 Female fertility figures represent a very early cultural period in Indian history. 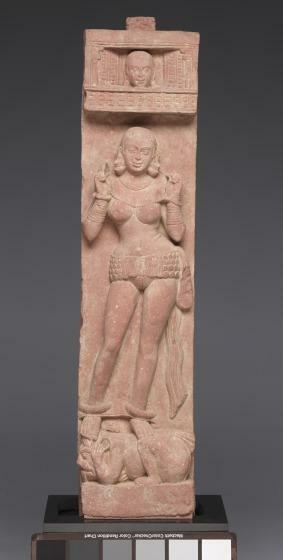 This female figure may be a yakshi, or female nature spirit associated with water and trees; they were symbols of prosperity. The sculpture takes the form of a beautiful woman in minimal clothes but lavishly ornamented with jewelry. The woman's figure is part of an architectural pillar, the whole of which suggests a scene from life, since a man whispers in a window overhead, presumably about the woman. 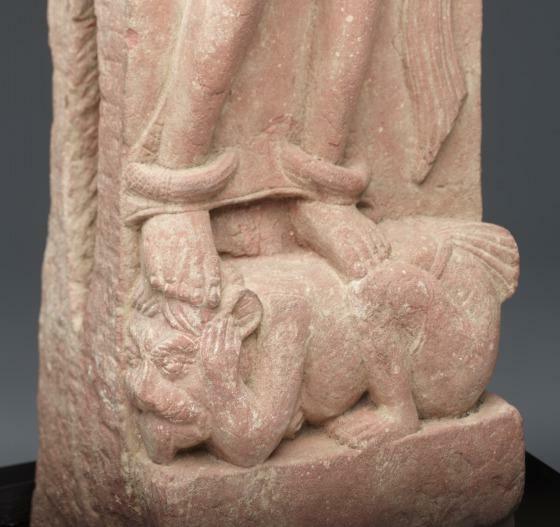 Mounted on a monsterlike creature, this figure is very much like the females appearing on the pillar uprights of a railing from the site at Mathura known as Bhutesar. 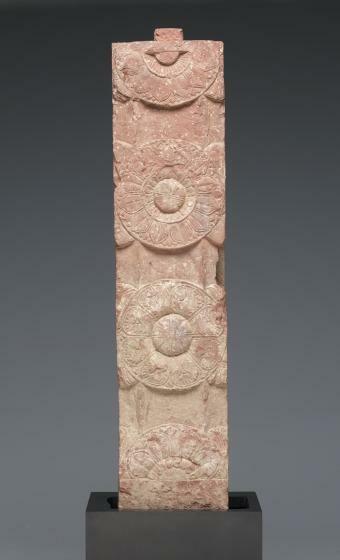 The Bhutesar railing figures, with which this pillar shares so much in common, can be ascribed to the Kushan period, probably to the 2nd century, suggesting a possible date for this figure as well. 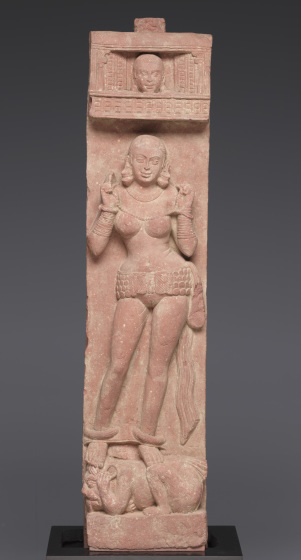 The spotted red sandstone from which it is carved was almost the exclusive medium for sculptures carved at Mathura, including those dating to even before the Kushan period and continuing right up to the present. "Pillar figure," in_ Dallas Museum of Art: A Guide to the Collection,_ ed. Bonnie Pitman (Dallas: Dallas Museum of Art; New Haven and London: Yale University Press, 2012), 97. Frederick M. Asher, "Pillar figure," in The Arts of India, South East Asia, and the Himalayas, Anne R. Bromberg (Dallas: Dallas Museum of Art; New Haven: Yale University Press), 35.